Many different types of frames are available. Most lampshades are designed with a top and bottom ring, with a top ring attachment of your choice. 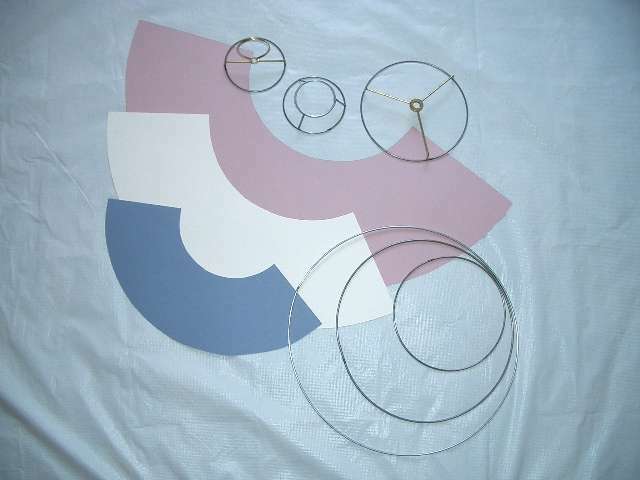 Below is shown a small sample of frame shapes, rings available, and pre drafted arcs. The top ring may be ordered in the following diameters: 2.5 to 18 inches. The bottom ring may be ordered in the diameters of: 3 to 24 inches. The "drop" (the length along the side of the lampshade between the top and bottom) may be between 3 and 19 inches. After picking out what arc/frame size, color, and trim , send an email to us for a price request telling the details of the lampshade and the type of image desired (from a photo or fabric pattern or words,etc.). We will send an email back with the price and time of shipping.